Unhealthy levels of smoke from fires in Washington, British Columbia persist through most of week. After several days of haze and unhealthy levels of smoke in the air in Central Oregon — most of which has drifted in from the wildfires burning to the north — the National Weather Service in Pendleton is forecasting clear skies and cooler weather from Thursday evening through Saturday. The air quality alert issued on Monday by the Oregon Department of Environmental Quality was in effect until noon on Friday for all Central Oregon communities. As of Tuesday morning, there remained two active fires burning in Jefferson County — the Tenino fire, burning on the Warm Springs Reservation, about 5 miles southwest of Warm Springs, and the Grizzly Road 1029 fire, burning approximately 11 miles southeast of Madras. 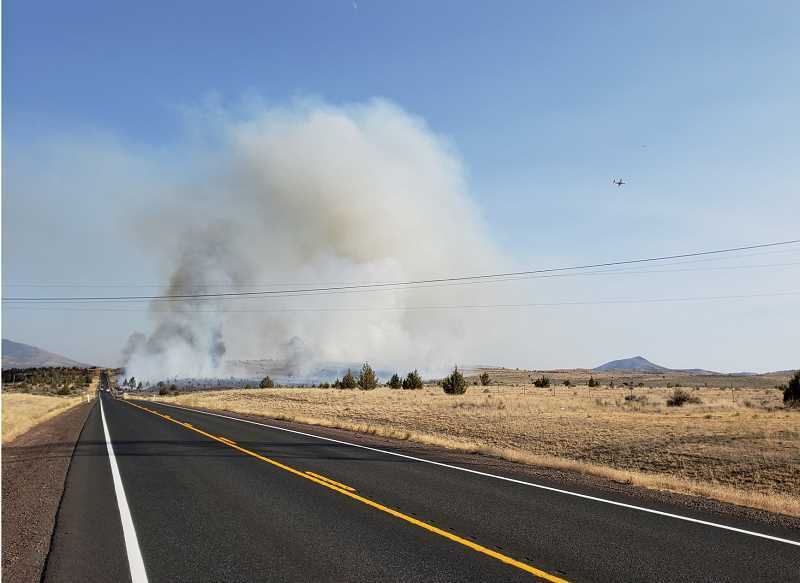 The fires, which started Aug. 17, resulted from a lightning storm that passed over the area Aug. 16, according to information from Central Oregon Interagency Dispatch Center. On Monday, the Tenino fire, burning in timber and grass, was estimated at 9,436 acres, and was 60 percent contained. The Grizzly Road fire was 360 acres, with no containment listed. The fires were among about 46 new fires started by the lightning storm. Other fires reported on Aug. 17 included the Spring Creek fire, located about 1 1/2 miles south of Monty Campground, and west of the Perry South Campground, on the Sisters Ranger District, and the Mile Post 6 fire, on the Crooked River National Grassland, which caused the closure of U.S. Highway 26, from milepost 2 to milepost 10, for several hours Friday evening. By Saturday, Aug. 18, the Spring Creek fire, which had caused an evacuation alert for campers to "be ready" to evacuate the Perry South and Monty campgrounds, had calmed, and was about 16 acres. The Mile Post 6 fire had burned about 1,500 acres by Saturday evening, with all perimeter fire lines holding. The Columbia Drag Boat Association was able to hold its annual races at the nearby Haystack Reservoir over the weekend, despite a Level 2 (be set) evacuation notice in effect at the Haystack campgrounds.